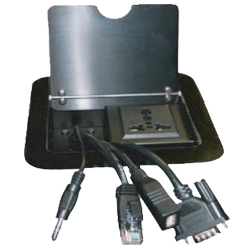 Desktop connectivity boxes from Magnum are designed to be installed into a table presentation system and provide access to computer video and audio, composite video and audio, RJ45 for network, data, telephone, and mains power connections. These units conceal any cables when they are not in use. Magnum Pop up boxes as the name stands for, are pop up boxes with hydraulic system built in. They are flushed on to the tables and when pressed pop up. 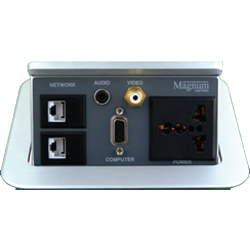 Magnum pop up boxes solve the issue for connectivity of Power, LAN, Audio &Video(VGA,HDMI). Magnum Cable Cubbies are simple connectivity solutions with a flip top which conceals the connectivity cables inside. The cables can be customized as per the requirement. They are flushed on to the tables and can be easily accessed just by flipping the top. 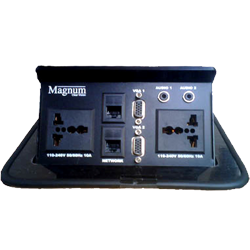 Magnum cable cubbies gives a meeting/conference table a neat connectivity of Power, LAN, Audio &Video(VGA,HDMI). Let’s get started on your next project!